Semitic tribe or group of tribes which overran the ancient Edomite country and established a kingdom which extended from Damascus on the north to Hegra (Al-Hajr) on the south. Their power at one period was felt in central Arabia as far east as Al-Jauf. They also occupied the Sinaitic Peninsula. The capital of their kingdom was Petra, the Selah of the Old Testament (comp. II Kings xiv. 7). The Nabatæans were in possession of some of this country as early as 312 B.C. ; for Antigonus, and afterward his son Demetrius, tried in vain to conquer them (Diodorus Siculus, ed. Dindorf, book xix., ch. xcv., xcvi., c.). At the time of the Maccabean struggle Judas and Jonathan, the sons of Mattathias, had relations with them (comp. I Macc. v. 25, ix. 35). It is probable that they had begun to overrun this country a century and a half earlier than this, and that they are alluded to in Malachi i. 2-4. Their occupation of Edom forced the Edomites up into southern Judah, causing the former inhabitants of Seir to occupy the Judean cities. It thus happened that in the Maccabean period Hebron was an Edomite city, the Judean border town on the south being Beth-zur. It was formerly thought that the Nabatæans were identical with the Nebajoth of Gen. xxv. 13, and with the Na-ba-a-a-ti of the annals of Assurbanipal; but Glaser has shown ("Skizze der Gesch. und Geographie Arabiens," ii. 418 et seq.) that the two were distinct. 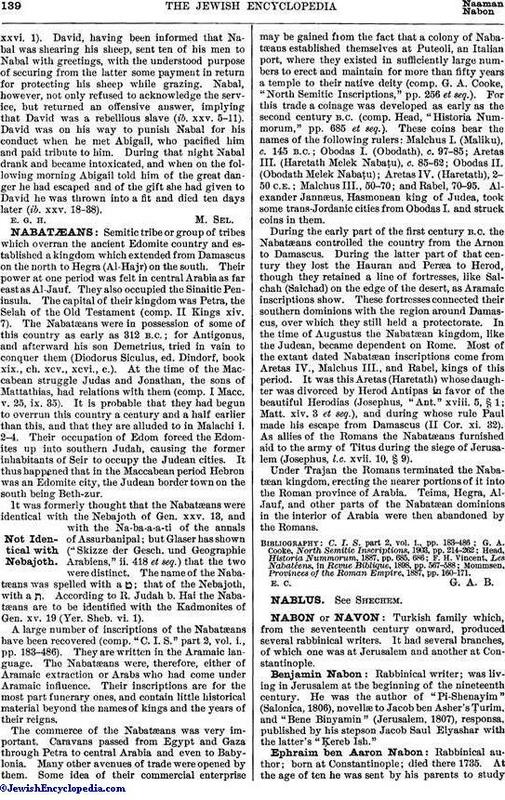 The name of the Nabatæans was spelled with a ט; that of the Nebajoth, with a ה. According to R. Judah b. Hai the Nabatæans are to be identified with the Kadmonites of Gen. xv. 19 (Yer. Sheb. vi. 1). A large number of inscriptions of the Nabatæans have been recovered (comp. "C. I. S." part 2, vol. i., pp. 183-486). They are written in the Aramaic language. The Nabatæans were, therefore, either of Aramaic extraction or Arabs who had come under Aramaic influence. Their inscriptions are for the most part funerary ones, and contain little historical material beyond the names of kings and the years of their reigns. The commerce of the Nabatæans was very important. Caravans passed from Egypt and Gaza through Petra to central Arabia and even to Babylonia. Many other avenues of trade were opened by them. Some idea of their commercial enterprise may be gained from the fact that a colony of Nabatæans established themselves at Puteoli, an Italian port, where they existed in sufficiently large numbers to erect and maintain for more than fifty years a temple to their native deity (comp. G. A. Cooke, "North Semitic Inscriptions," pp. 256 et seq.). For this trade a coinage was developed as early as the second century B.C. (comp. Head, "Historia Nummorum," pp. 685 et seq.). These coins bear the names of the following rulers: Malchus I. (Maliku), c. 145 B.C. ; Obodas I. (Obodath), c. 97-85; Aretas III. (Haretath Melek Nabaṭu), c. 85-62; Obodas II. (Obodath Melek Nabaṭu); Aretas IV. (Haretath), 2-50 C.E. ; Malchus III., 50-70; and Rabel, 70-95. Alexander Jannæus, Hasmonean king of Judea, took some trans-Jordanic cities from Obodas I. and struck coins in them. During the early part of the first century B.C. the Nabatæans controlled the country from the Arnon to Damascus. During the latter part of that century they lost the Hauran and Peræa to Herod, though they retained a line of fortresses, like Salchah (Salchad) on the edge of the desert, as Aramaic inscriptions show. These fortresses connected their southern dominions with the region around Damascus, over which they still held a protectorate. In the time of Augustus the Nabatæan kingdom, like the Judean, became dependent on Rome. Most of the extant dated Nabatæan inscriptions come from Aretas IV., Malchus III., and Rabel, kings of this period. It was this Aretas (Haretath) whose daughter was divorced by Herod Antipas in favor of the beautiful Herodias (Josephus, "Ant." xviii. 5, § 1; Matt. xiv. 3 et seq. ), and during whose rule Paul made his escape from Damascus (II Cor. xi. 32). As allies of the Romans the Nabatæans furnished aid to the army of Titus during the siege of Jerusalem (Josephus, l.c. xvii. 10, § 9). Under Trajan the Romans terminated the Nabatæan kingdom, erecting the nearer portions of it into the Roman province of Arabia. Teima, Hegra, Al-Jauf, and other parts of the Nabatæan dominions in the interior of Arabia were then abandoned by the Romans. Mommsen, Provinces of the Roman Empire, 1887, pp. 160-171.